Set next to the Getreidegasse in the heart of Salzburg's Old Town, the historic, fully renovated Hotel Elefant dating from the 13th century offers free WiFi and a restaurant. Guests of the hotel can enjoy the rich breakfast buffet in the on-site restaurant, which also serves Austrian cuisine and sweet local specialities. All of the individually decorated rooms of Hotel Elefant provide a bathroom, cable TV, and a minibar, a bathroom. Most of the rooms are air-conditioned, and some feature a comfortable seating area. 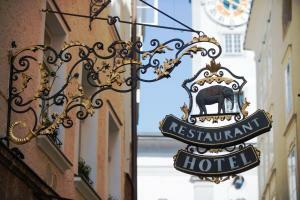 Mozart’s birthplace and the Festival Hall can be reached within a few steps from the Hotel Elefant. Mirabell Castle, the Hohensalzburg Fortress and the other side of the city centre are only 200 metres away.